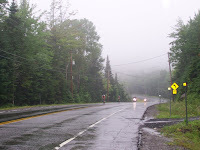 It is pouring rain outside and at 11:10 we are almost four and a half hours into the Ironman Lake Placid Triathlon. The photo (click to enlarge) shows the two race leaders, Bjorn Andersson from Sweden and Francicsco Pontano from Spain. You can see they are very close as they approach the key check point of the race at the bottom of the homestead driveway. The rest of the pack, even the third place person, is at least 8 minutes back. There have been some wrecks and those competitors are out of the race today. It is very rainy and foggy out; these are not conditions conducive to steep, fast downhills of which this course has plenty.